Bergère de France has been producing high-quality yarn in Bar-le-Duc, France since 1946. Over the years, their product range has grown to include patterns for crochet and knitting; needles and knitting accessories; and supplies for embroidery and cross-stitching. 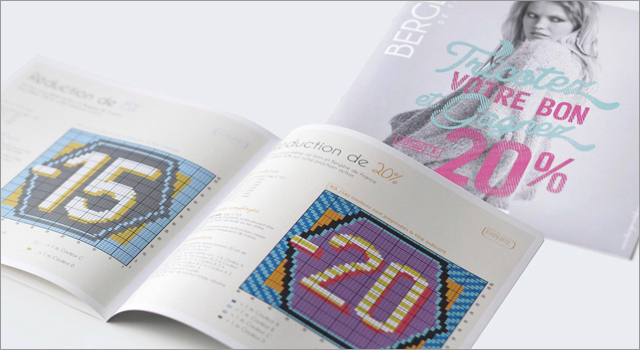 Recently, the yarn-maker’s ad agency BEING came up with a creative and inspired campaign to help increase business at the Bergère de France boutiques. Customers could use their leftover yarn, and using one of four patterns, hand-knit a coupon to earn savings of 5%, 10%, 15% or 20% off of their next purchase. The more complex the pattern was, the more savings the customer could earn for their handiwork. A great example of creating an campaign experience that connects directly to the customer’s use of the product. You can check out the knitted coupons in a photo gallery on BEING’s Facebook page.